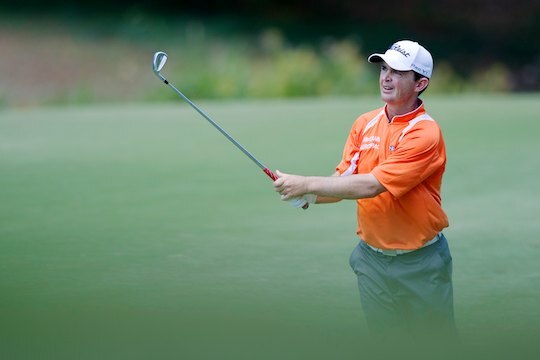 Aussie golfer Greg Chalmers revealed he is to undergo an MRI this week in Dallas on his nagging back. Chalmers has been battling a back injury for some time and with the injury forcing him to withdraw after just a handful of holes at the recent RBC Heritage Classic at Hilton Head in South Carolina. The 40-year old has been suffering pain for some time and is hoping the MRI will lead to identifying any cause and possible remedial treatment. “I played a shot from a bunker during last week’s Heritage Classic and felt something in my back and that was the end of me for that week,” he said at the Zurich Classic of New Orleans. “But then my back has been bothering me for some time, so I’m heading back to Dallas for an MRI. Concerns for his back has led to a frustrating year for the dual Australian Open winner. The Sydney-born Chalmers has teed-up in 11 PGA Tour events with a best finish of T15th in the Waste Management Phoenix Open and while he has made the cut in four others he has also missed the halfway cut in five, and of course, withdrawn from last week’s event in South Carolina. It has seen Chalmers earn $US 379,811 to be lying 117th on the money list. The golfer nicknamed ‘The Snake’ has now competed in 353 PGA Tour events since his debut in 1998 with his best finished being T2nd in the 2009 Buick Classic.